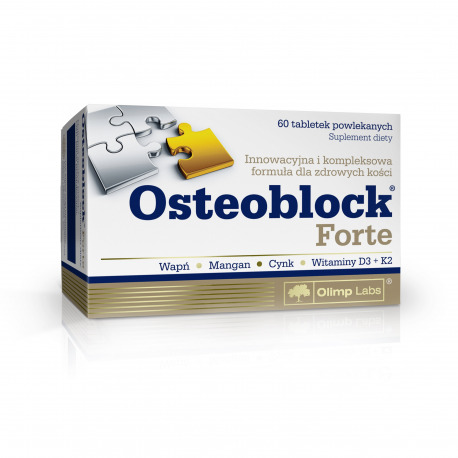 Osteoblock® Forte is a food supplement containing a complex of highly bioavailable minerals in the form of Albion® amino acid chelates (calcium, zinc, and manganese), vitamin D and vitamin K, which is provided in the form of easily bioavailable menaquinone-7. All of these ingredients constitute synergistic action, necessary to maintain healthy bones. It is particularly noteworthy that vitamin K is involved in the transport of calcium from the blood vessels into the bone tissue. 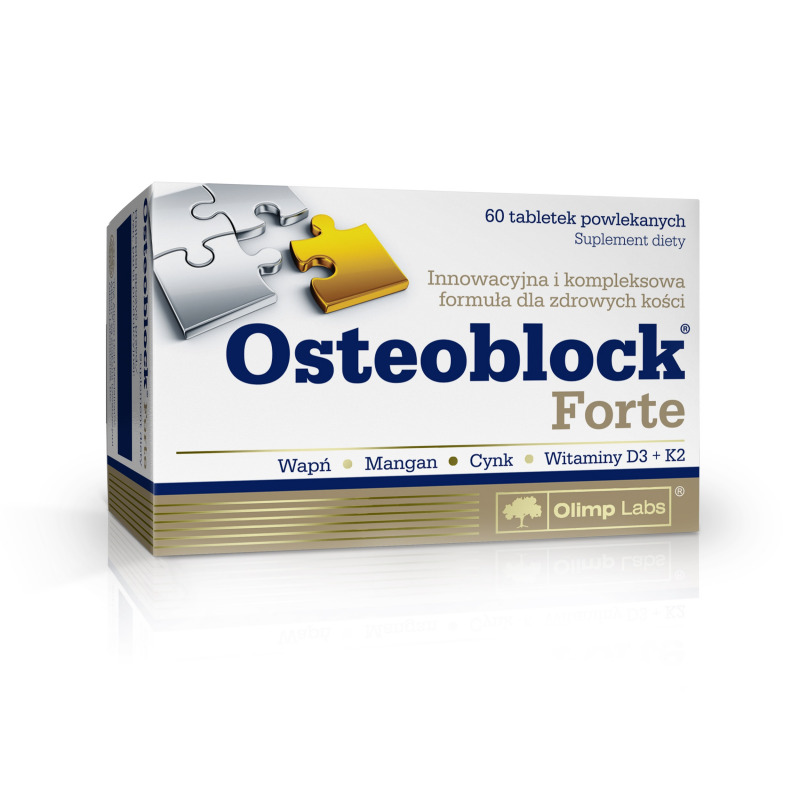 Product is intended: as a supplement to the daily demand for ingredients necessary during the period of rapid growth, during pregnancy and lactation, after fractures and injuries, for women during menopause and for the elderly, in whom bone resorption processes prevail processes of bone formation. Recommended use: 1-2 tablets a day, after a meal, or according to a physician's recommendation. The tablet should be taken with an adequate amount of water. Contraindications: Hypersensitivity to any of the ingredients. In the case of nephrolithiasis, kidney failure and hyperparathyroidism, use this product in consultation with your physician. Do not use together with other products containing high content of calcium, zinc or vitamin D. Not recommended to young children sue to risk of choking. Ingredients: calcium carbonate, calcium diglycinate (Albion® calcium amino acid chelate – Albical™), bulking agent - cross-linked sodium carboxymethyl-cellulose, glazing agents - polyvinyl alcohol, polyethylene glycol, talc; zinc diglycinate (Albion® zinc amino acid chelate), anti-caking agent - magnesium salts of fatty acids, manganese diglycinate (Albion® manganese amino acid chelate), menaquinone (MK-7) - Vitamin K, cholecalciferol - vitamin D; colour - Titanium dioxide.